The primary objective of the sled push is to improve lower-body strength and power so athletes can increase ground reaction force, i.e., the amount of force that they can put into and recover from the ground. Large ground reaction forces are essential for effective performance in activities that require acceleration, strength and lower-body power. Sled pushes are also a good tool for improving work capacity and muscular endurance. They are an excellent bridge between the weight room and running and can result in positive adaptations for both. Longer distances against lighter resistance have been shown to improve work capacity. Shorter distances against heavier resistance have been shown to have positive effects on acceleration, strength and power. A logical question is how much resistance should you use? The general “rule of thumb” is that a sled should not weigh more than 10% of the athlete’s bodyweight, because more than 10% can alter running mechanics and limit improvements in speed. While this rule is OK for speed, it is not applicable for improving acceleration for at least two reasons. First, sled pushes are usually performed over distances that are too short for most athletes to approach or achieve top speed. Second, sled pushes are designed to help improve acceleration, strength and power, not speed, and improvement in these qualities are achieved by applying force against moderate to heavy resistance. How much resistance? Resistance should be enough to force the athlete to lean forward and drive into the ground, but not so heavy as to drastically change running patterns, i.e., alter forward lean, hip extension and leg drive. To perform the sled push, start by standing in front of a sled with both hands on the sled handles at hip level. With the body inclined at approximately a 450 angle, initiate movement with short, powerful strides and gradually accelerate as quickly as possible. For acceleration, speed and power, start with 5 sets of 30-yard pushes with two minutes rest between sets. Gradually increase the workload to 10 sets of 30-yard pushes. For work capacity, do more work. More reps, more sets and/or longer distances will improve the capacity to do work capacity. Start with three sets of cut 30’s – quickly push a lighter sled 30 yards, turn it around and quickly push it back to the starting point. Down and back is one set. Rest two minutes and perform another set. Gradually increase the resistance, number of sets or distance or reduce the rest time. Be sure not to change more than one variable at a time. 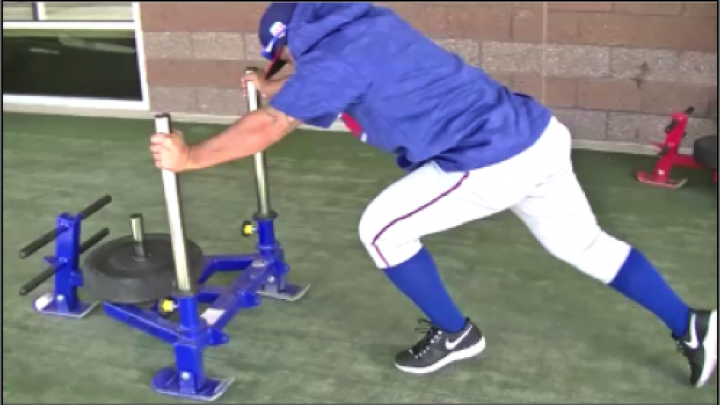 Adam Noel, MS, RSCC is a Minor League Strength and Conditioning Coach with the Texas Rangers.